I bought a '75 Chevy C20 pickup last month, and the carb looked like it needed a rebuild: fuel slowly weeping out of the accelerator pump and airhorn gasket, some funky behavior, etc. Last week the float sunk (turned out a chunk of the phenolic float broke off and the float was saturated). I gathered all the parts and rebuilt it this weekend, and I thought I'd share my processes for correcting leaking well plugs. I by no means take credit for inventing this method, but I thought I'd discuss what I discovered to better prepare others looking to attempt a repair. If I let the truck sit for a few days, the fuel bowls would drain, resulting in having to spend time cranking the engine before it would fire. I knew about common issue with leaking well plugs and the epoxy band-aid workaround, but I haven't owned a Quadrajet car/truck for some years and wasn't up to speed with better repairs. I searched this forum unsuccessfully, and then I read posts on a bunch of other forums. People recommended everything from epoxying over the plugs, tapping down the solder, re-soldering, installing specialty plugs with an o-ring, and installing threaded plugs. The threaded plugs seem like the most permanent and trustworthy repair, so I went for it, but some of the internet info was bogus, so hopefully the following helps others. I know my following info exists in rebuild books, but I like free when I can get it. (2) 10-32 x 1/4" Allen plugs. (2) 7/16-20 x 1/4" Allen plugs. Someone had long ago epoxied my well plugs, which was cracked, so a cold chisel easily chipped off the old epoxy. 1) Before soaking the carb body, I filed the solder on the primary plugs flat so that I could get a good center punch. I found that if I filed deep enough, I could actually see the well, allowing me to get an accurate center because the wells were not perfectly centered in the casting. I punched both the primary and secondaries for center (secondary centers don't need to be accurate). 2) Drill out the primaries at the same angle as the well with a 1/8" bit. Drill through the aluminum secondary plugs. In both cases, be very careful to go slowly and softly as you break through the other side so that you don't damage the primary jet threads or the secondary wells. 3) Screw the self-tapping screw into the secondary plug far enough for a solid grip. 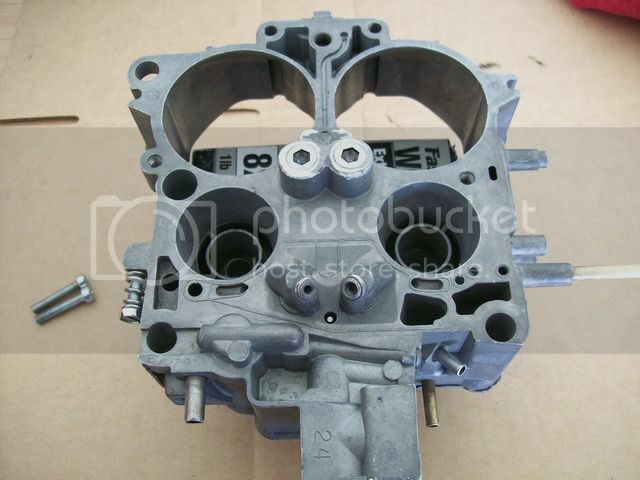 Place a piece of wood on the carb body for leverage and protection, and pry the screw up using dikes. My plugs started spinning with the self-tapping screw, so they lifted easily. Clean up any jagged solder using the file. 4) Tap the primary wells to 10-32. The 1/8" bit is a little small for the tap, but there's not much wall thickness to work with. I went slowly and straight, and the tap worked fine. All the info I found online said to tap just to where the plug will seat flush with the casting, but this didn't work with my wells. The first bit of each hole was irregularly shaped and partially solder, so I couldn't get good threads cuts until 1/16" down the hole on one side and almost an 1/8" on the other. Cut little by little, and continually thread in the plug as a depth gauge. 5) Tap the secondary wells to 7/16-20 all the way to the bottom. You don't have much thread room to work with, so make sure you start the tap true. 6) Blow out everything with air and canned carb or brake cleaner to remove shavings, and then soak the carb in cleaner as you normally would. 7) So here's where my plug woes come in. Because I had to tap the primaries deeper, the plugs seated closer to the center of the jet boss. I went ahead and mocked up everything by seating the plugs, reinstalling the jets and metering rods, and testing to make sure the metering rods would not bottom out on the plugs. They didn't, luckily. Now for the secondary plugs, the online sources I found claimed to use a 3/8" long plug, which is incorrect. 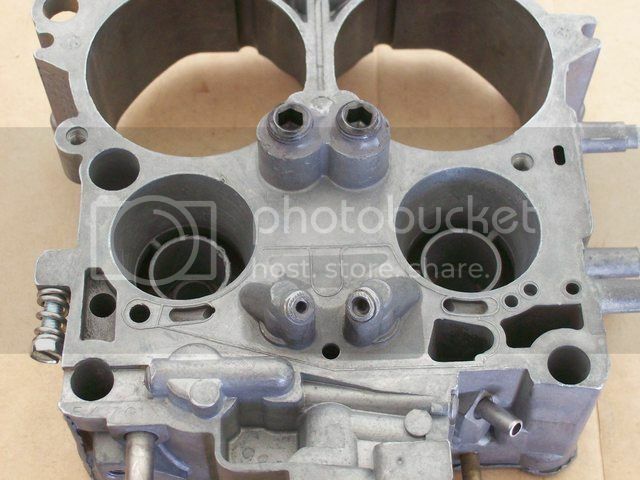 I discovered that the secondary wells are not that deep and that a 3/8" plug protrudes to where the throttle body hits them before the gasket seats. Unfortunately for me, the best local hardware store I have near me (Ace Hardware) was out of 1/4" plugs, and Lowes didn't have any fine thread. Wanting to get this project finished and knowing that I needed to let the epoxy cure overnight, I decided to install the 3/8" and then cut them off, but 1/4" is the way to go to bypass the cutting. 8) Coat the plugs liberally in epoxy, keeping epoxy off the very end of the bevel so that you don't have any small chunks of epoxy anywhere in the wells after the plugs seat. Install the plugs being careful to snug them down just enough to seat, but remember that there's not much meat in the aluminum threads, so don't strip them. 9) Smooth out the epoxy around the rim of the plugs and make sure to clean up any epoxy protruding into the wells; there shouldn't be any epoxy in the wells if you didn't coat the bevel all the way to the end. Let the epoxy dry overnight, preferably for 24 hours in a warm room before testing or using the carb. 10) Because I used a 3/8" long plug for the secondaries, the next day I cut them off pretty much flush. 11) Mix up some soapy water and cover the plugs. Block the appropriate passages and blow compressed air into the jet orifices, checking for bubbles. I found none. Afterthoughts: If I had to do it again and knew I'd have to tap the primary wells deep, I'd use 3/8" long plugs to get more threads. Like I said before, I needed 1/4" long plugs for the secondaries, but I worked with what I had. Some people say they make plugs out of cut-off bolts and cut in a flat-head, but I feel that the even beveled mating surface of the Allen plugs will make a tighter seal against where the threads in the wells end. A bolt will rely on the starter thread to form the seal, which might not be the best seal the way bolts are cut at the end and if the last well thread and the first plug thread happen to align. Some online sources claimed that JB Weld isn't good, that Permatext gas tank repair is better, or that marine-tex epoxy is better. Well, marine-tex isn't really designed for continuous engine heat cycles from what I have read on their website, so I'm wary of that. As for JB Weld, I have repaired a gas tank filler neck in a case where I couldn't solder, and I never had an issue with the JB Weld dissolving in eight years. I've also used JB Weld to repair an accessory part on an engine that received as much heat as a carburetor will, and the epoxy never failed. So the gas resistance and heat-cycle resistance that I've experienced made JB Weld the epoxy of choice. I don't know whether or not the Permatext repair is made for heat cycles in mind. I hope this information helps those looking to repair leaking well plugs. While I haven't rebuilt one in a while, I loved working on the Quadrajet. It's such an amazing mechanism for its time and place in automotive history. Nice work, and an excellent write-up, too. Thanks for posting. 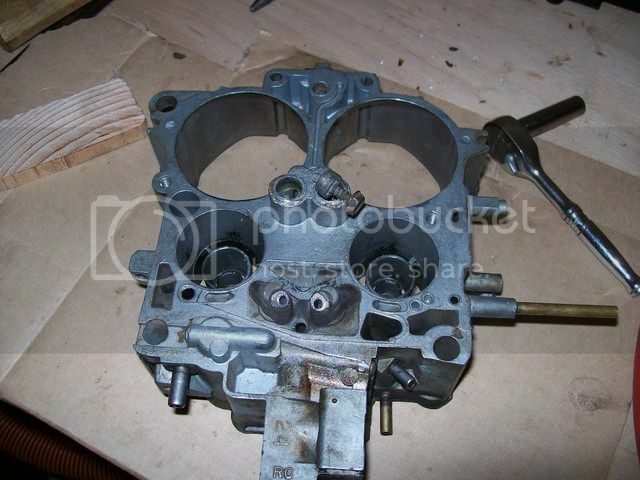 As you found rebuilding a quadrajet is an art. There were a few aftermarket parts that helped when we did them daily in the 70s. See my Quadrajet Notes for details. Last edited by mychevyii20; 24th-November-2015 at 10:35 AM. Thanks, Gerry. It's my pleasure. I'm flattered that you've linked to this thread. Yes, Quadrajet rebuilding and tuning is definitely an art that we are losing as older generations give way to newer. 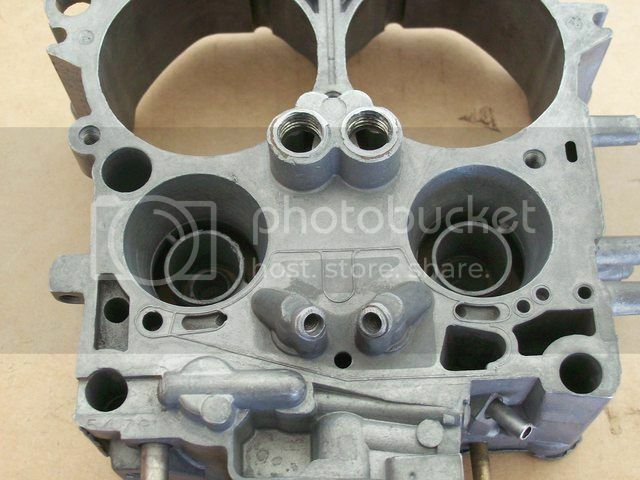 The techniques and information often become either lost or misconstrued as the years go by, not to mention the parts becoming harder to find/more expensive. 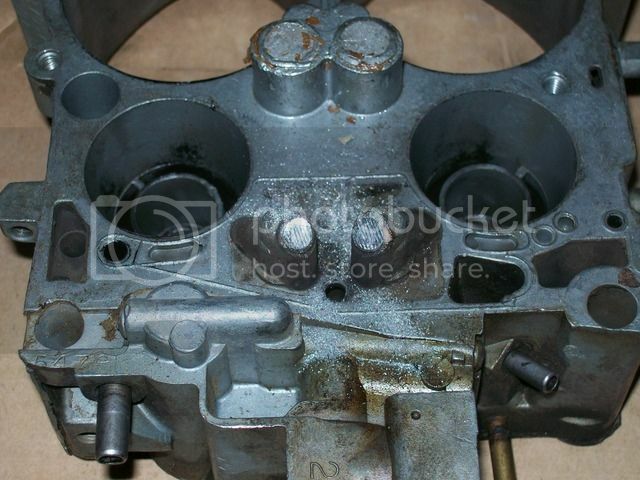 On this carb, the air-horn was bent as much as the gasket would allow from over-tightening, and it took some time with the vice, sockets (for pressure points), and a propane torch to get the air-horn bent back into good sealing shape. I imagine specialty carb shops that still do a lot of Quadrajets have a special jig of some sort, but that's how I was always taught to tweak them back into shape. It worked, so I'm happy. The idle tube retainers were also so stuck that I couldn't pull them with a screw and heat or even with an easy-out. I ended up having to drill out the retainers completely.